TEPCO has sampled the gas content of many pipes passing through the containment walls of unit #1, using hydrogen detectors with a greater sensing capacity than those used when the hydrogen was first discovered earlier this week. It turns out the concentrations are in the 61-63% range. 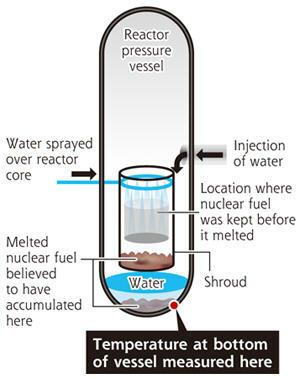 TEPCO also analyzed for oxygen, since some oxygen must be present for an ignition or explosion. They found none. Thus, there is no danger of another hydrogen explosion. The extremely high concentration virtually confirms that the hydrogen is residual from the fuel damage period of March 12, and trapped in the piping since then. NISA has ordered TEPCO to also check the containment-penetrating pipes on units 2 and 3, which TEPCO already said they were planning this past Monday. (NHK World)The sampling of the piping in units 2 and 3 could produce some interesting results. If all three fuel cells experienced a full, core-relocating meltdown, then the residual hydrogen concentrations trapped in the three unit’s pipes should be similar. Significant differences could indicate differences in the relative severity of fuel meltage. We suspect the pipes of unit #3 will have hydrogen concentrations similar to unit #1, but unit #2’s pipes will be significantly lower. It seems JAIF has decided to post plant conditions at Fukushima Daiichi on a weekly schedule, rather than daily. Thursday’s posting shows a dramatic drop in temperatures for all three RPVs. Unit #1 is at 76oC, with an injection rate of 3.8 tons per hour. Unit #2 is down to 99oC, with a total injection rate of 10 tons per hour. Unit #3 is at 79oC with a total injection rate of 11 tons per hour. (JAIF)The following diagram of the injection pathways is from Yomiuri Shimbun… It seems the cooling water injections are doing a more efficient job on unit #1 than the other two. It also seems the use of the internal feedwater spray flow-paths on units 2 and 3 have been a success, but the higher relative flows indicate a less efficient cooling effect than unit #1. This indicates there are blockages to cooling flow inside units #2 and #3 that are not the case in unit #1. While it is true that units #2 and #3 have ~50% larger fuel cells than unit #1, this does not account for the differences in flows. The decay heat level for unit #1 is greater than with both other units because it was near the end of its fuel cycle. According to NISA, the principle governmental regulatory group, there was a complete failure of all electrical power at the Fukushima off-site emergency response center, 5km from the power complex, an hour after the earthquake. When the earthquake-caused regional blackout happened, the response center’s emergency diesel generator started automatically. It ran for about 45 minutes, then stopped. Since the response center was a gathering point for TEPCO administrators, local officials, and Tokyo government representatives to meet and decide on public protective actions, it was imperative that the facility be re-powered. The facility blackout made it impossible for anyone at the response center to follow what was happening to the power complex and monitor the emergency systems that were (or were not) operating. At midnight, more than 8 hours into the facility blackout, a diesel generator technician discovered a faulty electrical switch on the control panel. The switch’s failure had stopped the fuel oil pump feeding the diesel. The switch was replaced and the response center was re-powered by about 3am on March 12. (Yomiuri Shimbun)According to control room records, communications between the power plant itself and outside local/federal officials was by a single land line to Fukushima City and Tokyo during the emergency response center blackout. This indicates that public protective action orders came from Fukushima City and/or Tokyo during the first 12 hours at Fukushima, and not from “local officials” nearest the power complex who were necessarily the most familiar with nuclear systems due to their physical proximity. The Tokyo government has finally decided on how to dispose of the enormous amount of rubble and debris caused by the earthquake and tsunami. Some of the northeast prefectures have already begun disposal themselves, but many have done little rubble removal while waiting for Tokyo to do it for them. One of the on-going issues has been where to put this virtual mountain of debris…and they’re not talking about the cesium-laced stuff near around Fukushima Daiichi. The non-Cesium-laced debris is 10 times greater than the cesium-laced material. Regardless, Tokyo has designated 42 sites across Japan for disposal locations, and Tokyo will foot the bill. At the end of the announcement article, the government says they have found that the Cesium-laced debris within Tokyo itself is 15 times below the national standard for disposal. Thus, handling and disposal of the city’s wastes will proceed as it has for years. (Yomiuri Shimbun)We say, it’s about time! The nation’s quake/tsunami recovery is secondary to soothing unrequitable fears of radiation for way, way too long.